Do you live in a real craphole of an apartment or house? Leaky roof? Peeling paint? It just plain looks bad and there's nothing you can do? Turn rooms and halls around with this indoor tent. The walls and celings are modular, water resistant and resizable so they can fit around doorways and windows, plus they come in a variety of colors and patterns. Weatherproof cords run along the outside of the walls giving you a more convenient set of wall outlets and other features which will stand up to crappy indoor conditions. Some models have lights in the celings. All rooms come equipped with glow in the dark strips and emergency lighting to tell you where exits are when the fire alarm goes off. Also they have smoke detectors attached to the walls. These tents are also perfect for hallways. Floors available in plush, vinyl, astroturf or foam rubber. Not for use with kitchens or bathrooms, yet. Excellent idea! I love it. I can always camp, no matter where. I used to sell bedlinens at a beeyootiful store with beeyootiful wimmenfolk. After heavy rains some pipes burst and several stores on the lower level suffered the effects - *think Stanley Kubrick's "The Shining" with water in place of blood. * This happened right at closing time, so I piled merchandise high on the display beds and covered best I could so as to protect merchandise from the seepage coming through the wall-ceiling joints. Afterwards, one bed waaaay in the back held my elf and the lovely girl I was woiking with for a pleasant, romantic while with the sound of indoor waterfalls our accompaniment. Bun for the memory. (+) I once put a tent up in a public park gazebo. After hillwalking all day we arrived in a seemingly deserted hamlet. As it was raining heavier than mo fo, my friends and I decided that we may as well use the extra shelter. Within an hour of putting up our tent, the rest of the small park was filled with a school holiday group from Germany. They were very disturbed to find that a bunch of hermit Scotsmen 'lived' in the park. I lived in a dive that was so crappy; water would drip from the light bulb in my room when it rained. 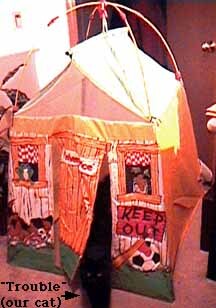 I used to have this Fisher-Price "toy" tent, complete with a printed-on flower box. I lived in a dive so crappy that I came home one day to find the bathroom ceiling right above the toilet had caved in, showering the area with a deadly amount of weird concerte stuff and rotten wood.